With the New Year underway, it’s the perfect time to look back at what made 2014 an unforgettable year. 2014 was truly a banner year for us at Ugly Mug Marketing. During the year, we took the quality and technical capabilities of the websites we developed to a level unmatched by any of our competitors. I’m not just referencing local or regional competitors, but our global competitors, as well! I’m extremely proud of the work our teams did, and of the work they are continuing to do. 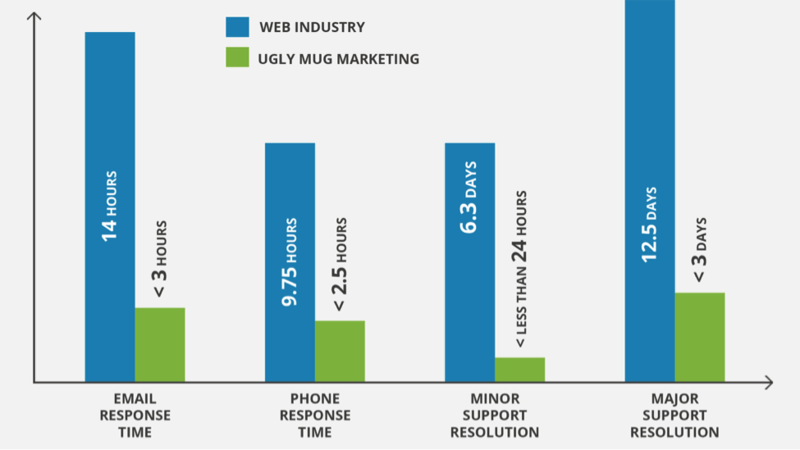 They are making Ugly Mug Marketing remarkable, both through our finished products and in making a difference for our clients. We rolled out a completely updated admin panel on all of our new custom websites. This new admin panel is not only one of the most secure existing on the web today, but it is also one of the simplest to use. Designed and developed a simple to use photo editing software directly into our custom admin panels. Now clients can easily edit and crop photos directly in their admin panels. Launched an entirely new version of our industry-leading Flex-SEO tool, which is found directly inside our custom admin panels. There isn’t another admin panel in existence that gives clients so much power with virtually no need for coding knowledge. We, again, achieved substantial growth in 2014 without spending any money on advertising. The vast majority of our new clients come to us as a referral from a previous client. If they weren’t a referral, then they found us organically on the internet. This year marked a major transition in the way people use the internet. During Black Friday and Cyber Monday, more consumers placed orders online via a smart phone or tablet, than through a laptop or desktop computer. Chances are good you could have predicted this trend by your own personal mobile internet usage. At Ugly Mug Marketing, we continually study market trends to ensure the websites we build for our clients stay ahead of these trends. In late 2011 we noticed the increasing mobile internet usage trend and began exploring and determining the necessary steps we needed to take to ensure our clients could maintain their positions as leaders in their respective fields. I’m proud to say that our development team was one of the first (not locally, not regionally, not nationally, but globally) to begin experimenting with responsive design. In 2014, 86% of our new clients opted to have their websites built utilizing responsive design. I’m proud to say our responsive websites are not only beautiful, but extremely efficient and effective. A client on the west coast averaged in excess of $100,000.00 per month in sales throughout 2014. Yep, that’s over $1,200,000.00 in revenue — directly through their website. On the east coast, a client broke the $100,000.00 per month mark through their website in September, and this number is continuing to grow month-over-month. We had one client break the 100,000 mark for Twitter followers, and another broke the 100,000 Facebook page “likes” benchmark. Our clients landed some major media in 2014, including Dr. Oz, Today, Good Morning America, Wall Street Journal, Forbes, Entrepreneur Magazine, Vogue, and The New York Times. Another client broke the 100,000 benchmark for email subscribers on their email list. As a side note, our most successful web clients are laser-beam focused on strategy. They don’t major on the minor. They fully understand their website is a tool which must be continually used, tweaked, and improved. They are willing to–and do–invest substantial money in their online presence. A Birdseye View of Our Industry! Our team is truly amazing! Each is committed to providing remarkable service with each and every interaction. This commitment is reflected by the fact that our clients love us! It’s because of you that we had our best year ever! Where Are We Going in 2015? Because of you, and the success we experienced in 2014, we have more amazing opportunities in front of us than ever before. We are in the process of exploring several of those options. Our plan is to determine which of these will be the best for us at Ugly Mug Marketing, as well as for our clients. The acquisition of a couple of other companies (those who are in both alignment with our values and who could greatly benefit our clients). Launching a new software designed to keep websites fresh and interesting. Adding another book to an existing collection of three published books. Launching a coaching program to teach freelancers how to rapidly scale their businesses. Developing training courses and materials to help our clients leverage the internet. Launching our own Ugly Mug Marketing physical products. In addition to all of those, we are committed to continually pushing ourselves away from our comfort zones, and helping our clients reach their goals. We could not be more excited about what’s in store for us over the next year, and for the opportunity to work with you throughout 2015!